The use of dendritic fibrous nanosilica, or DFNS, has increased in many scientific fields such as solar energy harvesting (solar cells, photocatalysis, etc. ), catalysis, surface plasmon resonance (SPR)-based ultra-sensitive sensors, energy storage, CO2 capture, biomedical applications (protein and gene delivery, photothermal ablation, drug delivery, bioimaging, Ayurvedic and radiotherapeutics drug delivery, etc. ), and self-cleaning antireflective coatings. The distinctive fibrous morphology of the DFNS class of materials confers them with various crucial characteristics that were magnificently adopted for use in a wide array of applications. The DFNS fibers were made functional by using different ionic liquids, organometallic complexes, organic groups, peptides, polymers, DNA, enzymes, genes, and so on. They were even compounded with metal oxides and hydroxides, bi-metallic nanoparticles (also with single metal atoms), metal nanoparticles, and quantum dots. In addition, they were used as hard templates for producing carbon with high surface area and fibrous morphology. DFNS-based zeolites with distinctive properties were also produced. Dendritic fibrous nanosilica (DFNS), also known as KCC-1, has a unique fibrous morphology and a high surface area with improved accessibility to the internal surface, tunable pore size and volume, controllable particle size, which made it useful in the fields of energy, environment, and health. CREDIT: Ayan Maity, Vivek Polshettiwar. DFNS allowed for loading of huge amounts of catalytic active sites with extremely high accessibility in comparison to that of traditional mesoporous silica materials. Moreover, owing to the radially oriented pores, or channels, with sizes that increased from the sphere’s center toward its outer surface, reactants could easily access active sites inside the channels, thereby improving their reaction with catalytic sites, leading to manifold increase in the catalytic activity of the reactants. DFNS was utilised to synthesize innovative photocatalysts by coating them with g-C3N4 and TiO2. Apart from assisting in enhanced accessibility and mass transfer, the fibrous morphology of DFNS also paved the way for the development of a uniform conformal coating and a high loading of guest molecules and semiconductors. Specifically, the fibrous structure of the material improved the light tapping characteristics of the catalyst owing to multiple scattering effects and the reflection of an increased amount of incident light. DFNS was also adopted to enhance the functioning of dye sensitized solar cells (DSSCs). Apart from energy harvesting, DFNS-coated carbon spheres were also employed for energy storage by means of supercapacitors. DFNS-amines and DFNS-oxynitrides, which are functionalized DFNS, were fruitfully adopted to synthesize effective CO2 sorbents, which can play a part in overcoming the possibly threatening climate change problem. Functionalized DFNS was also adopted to eliminate pollutants (e.g. phosphorus, toxic metal ions, polyaromatic hydrocarbons, etc.) from water bodies, which is a large environmental problem. DFNS was found to be effective at administering different anti-cancer drugs, genes, the Ayurvedic drug curcumin, DNA, and antimicrobial enzymes. Furthermore, a range of auxiliary functions—such as radioactivity, stimuli responsiveness (light to thermal), superhydrophobicity, fluorescence, anti-reflectance, and so on—were combined into DFNS. This enables their use in real-time bioimaging, photothermal ablation therapy, self-cleaning coatings, and other applications. DFNS-based surface plasmon resonance (SPR) was adopted to sense and quantify contaminants. The same technique was also adopted for conducting an ultrasensitive enzyme-linked immunosorbent assay (ELISA+) with a 2000-fold improvement in detection sensitivity. 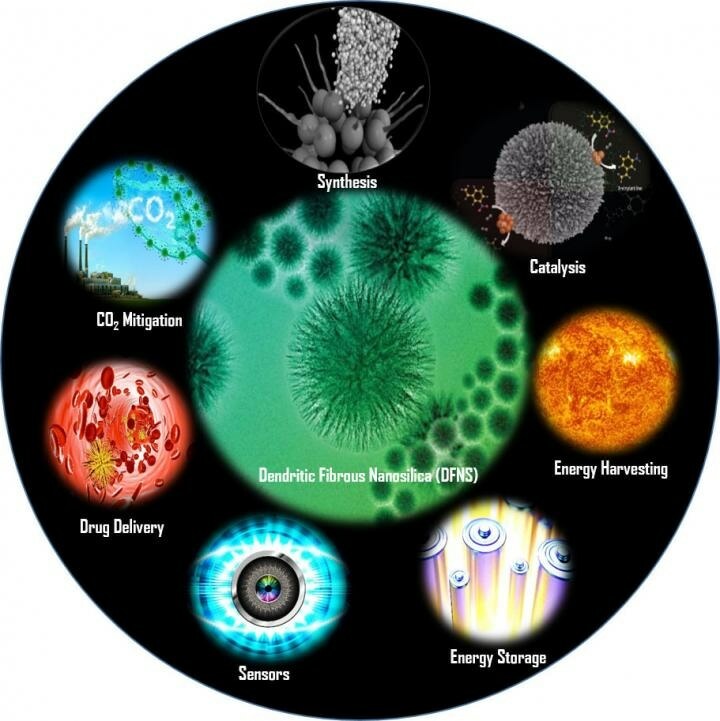 DFNS appears to be an all-in-one nanomaterial and has vast prospects for further enhancement. Despite the fact that DFNS has exceptional physical, textural, and chemical characteristics and offers outstanding outcomes in a range of applications, the transformation from DFNS synthesized as part of basic research work in the lab to industrial application is reliant on partnerships among academic researchers and industry. Consequently, noteworthy developments in the production and usage of DFNS were accomplished, and DFNS appears to have exhibited exceptional abilities as a superior substitute to traditional silica materials such as MCM-41, Stöber silica, SBA-15, MSN, and others. The superior activity, lower cost, and noticeable stability of a number of dendritic fibrous nanosilica-based materials keep up our hypothesis that this type of material can be practically applied for different applications such as energy harvesting and storage, environmental remediation, catalysis, drug delivery, gas capture, analytical chemistry and more.